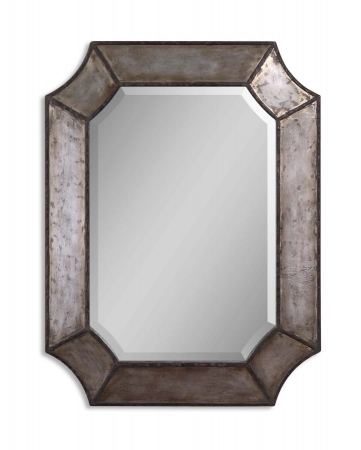 This simple and uniquely shaped mirror delivers an antiqued look to your wall through the hammered aluminum frame. The frame also sports burnished edges and rustic bronze details for full on elegance and aged style. 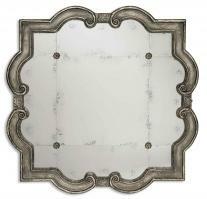 Measuring 24 inches by almost 32 inches, this mirror is a great choice for a bold face on your bathroom vanity wall. The piece can be mounted vertically or horizontally, so you can also use it as a decorative mirror in many decor situations. 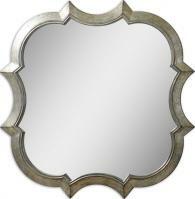 The mirror weighs 27 pounds and comes with brackets for mounting on any wall in your home. Material: Aluminum is a relatively soft lightweight metal, malleable, and silver in color; found in many products such as electrical wire, soda cans, and car parts.